Stock Replacement - Choose Powerflex Street (Yellow: 70A or Purple: 80A) for stock replacement to maintain ride quality while improving tire life. Street Performance - Choose Powerflex Street to maintain ride quality or choose Powerflex Race for ultimate performance. Race (Black: 95A) - Choose Powerflex Race for ultimate performance, autocross, time trials, rally, and road racing. The option to choose your durometer is available on each part listing. Where necessary as decided by our product engineers some parts may only be available in the Black Series race version. In these cases the higher durometer is necessary and will not cause unwanted noise or vibration. 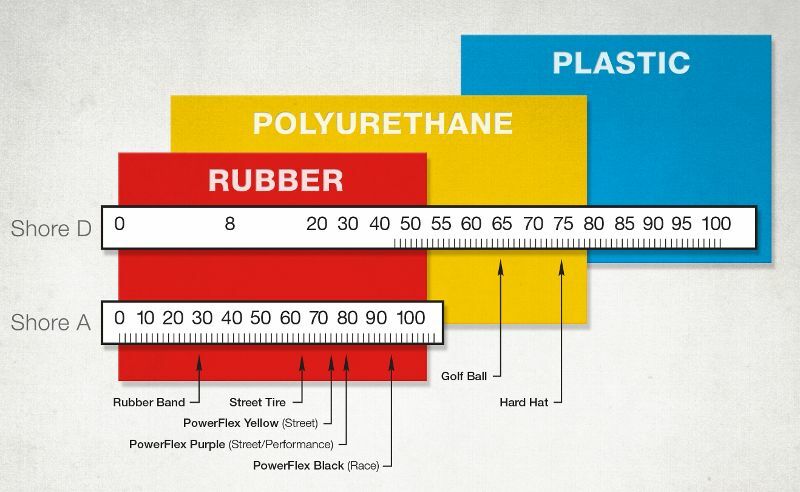 Powerflex polyurethane bushings are designed to decrease the amount of deflection in your car's suspension which improves handling, driver feedback, and tire wear. We use our own premium polyurethane formulation to provide minimal NVH (noise, vibration, harshness) and increased longevity over stock rubber bushings. Powerflex is a truly engineered product, not just a copy of the stock part in a different material. Redesigned to address common factory failure parts, Powerflex bushings allow the articulation required to maintain control of movement for increased performance while far outlasting the stock parts they are replacing. Additionally, Powerflex Engineering Line products for some fitments include unique features like polyurethane monoballs and offset geometry to provide ultimate performance without the harshness of metallic race parts. Powerflex polyurethane engine/drivetrain mounts and reinforcements are available for some fitments to reduce movement for better throttle response and more power to the wheels. Powerflex copper-based grease is supplied with every bushing set and is the only lubrication we recommend - standard "anti-seize" or white lithium grease traditionally used with urethane bushings are not as effective. Bushings will rarely need re-lubing due to the unique grooves and knurls cast into the material to hold the lubricant.